Family man Jay Follet is called to his father’s bedside in the dead of night in the summer of 1915. Fearing the worst from his ailing father, Jay speeds through Tennessee backroads only to find a false alarm waiting for him at his childhood home. On his way back to Knoxville, however, his car malfunctions while on bad terrain and Jay is killed instantly by hitting his chin on the steering wheel. A Death in the Family, then, is about how his family deals with the grief of his loss. The narrative floats between his now widowed wife, his atheist brother-in-law and his eager-to-please son Rufus, as they come to terms with Jay’s death over the two or three days following the accident. 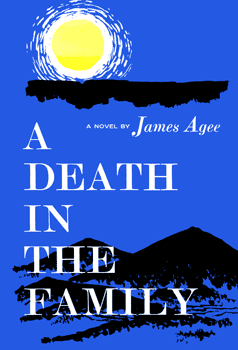 The thing I liked best about this book, in addition to how real it felt (author James Agee lost his father to an accident when he was six, some have called this novel autobiographical), was how good a job it did at putting you into the mindset of a child. There are flashback sequences from young Rufus’ point of view scattered throughout the book, delineated from the rest by way of being italicized. In these parts, Agee deftly captures the feeling of being a small child, a precocious child who only half gets things that he is told and ends up extrapolating meaning for words like “instantly killed,” “drunk,” and an “eightfoot embankment.” Rufus is an excellent reader surrogate as, through a child’s eyes, we have to look again at the world to see what is trying to be imparted to the boy. It’s also helpful given the time period the novel is set in, 1915, to have an inquisitive mind that wouldn’t take for granted some of the social mores and taboos of the era, allowing us to experience a way of life that has since moved on. A lot of people seem to use their devotion like that, like a crutch that explains every single thing that happens. It’s defeatist. But enough about that. A Death in the Family is by no means a fun novel, but it is a very interesting one. Agee pours his real-life grief into the story, and it feels palpably real as a result. Definitely a must for someone who wants to understand how death changes people. Total pages read since January 1st: 6798 pp.